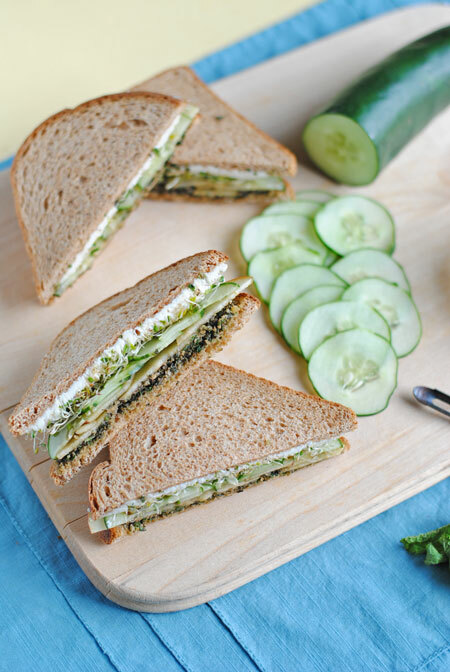 Oh how much I love this Goat Cheese & Mint Pesto Sandwich. I first had it at Pinewood Social here in Nashville and it’s been in my dreams ever since. The bad news? It’s no longer on the menu. Oh the horror! What a dream crusher to have this awesome sandwich once and never be able to have it again…until today! I made my best attempt at recreating it at home. It came really really really close, so I’m happy. It’s goat cheese, mint pesto, sprouts, and thinly sliced cucumbers and apples. It sounds like nothing spectacular, but trust me, it is. 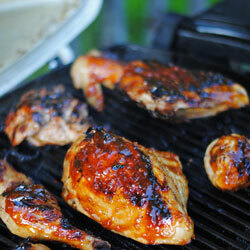 It’s perfect for when you’re craving something really flavorful, but not heavy. Love my imitation sandwich! Below in the recipe area you’ll see I give you two versions of mint pesto. One is the full on, full fat, regular pesto with olive oil and cheese. 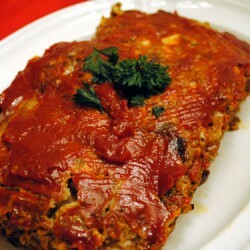 The other is a healthier version that skips the cheese and oil. In trying to be healthy and save some calories, I used the healthier version. It was really good, but wasn’t quite spot on to the original at Pinewood. I think the key is using the pesto with cheese and olive oil. Take your pick! 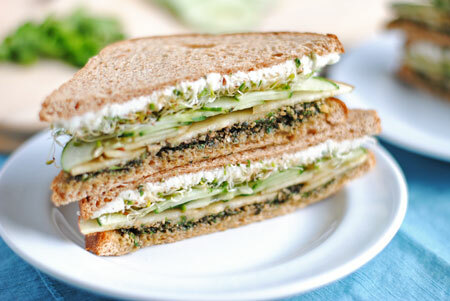 This sandwich is so refreshing thanks to the crisp slices of cucumbers and apples. I used Fuji, but I think tart Granny Smiths would work wonderfully. You all know I’m a big fan of texture and you get a nice mixture here. Creamy goat cheese and crunch from the sprouts, cucumbers, and apples. The mint rounds it all out with more freshness. Another perfect sandwich for warm weather! How was your weekend? Mine was awesome on Saturday. My mom came to visit and we went to the flea market where I scored a few more prop items. It’s become an addiction! I got this really cool old egg separator, metal juicer, ladle, and another set of measuring spoons. I’ve seen these measuring spoons for $10 bucks in antique stores and I’ve now bought two sets each for $1. Holla! We also drove around Nashville looking at places for me to live. I’ve owned a condo for about eight years and I’ve been ready to move for about three, but thanks to the housing crash, I’ve been stuck. Now that the market is getting somewhat better, I’ve been working to fix the place up a bit and hopefully put it on the market soon. It’s exciting and terrifying at the same time. Exciting because I cannot wait to move closer in to Nashville, but terrifying because it’s new and strange. There are things I’m looking forward to about being a renter like not paying for appliances or plumbing when there’s a problem, and being able to move if I don’t like it. Then there are things I’m going to miss. My garage being a huge one! Color on the walls, water dispenser in my fridge, glass stove top. Stupid little things that make me sad to lose. Plus I feel like I’m going at it a little backwards from owner to renter. And there’s the whole space issue. I’ll be downgrading in size and I’m looking around thinking “Where in the world is all this stuff going to fit?” I’ve got a few months before any of this gets in motion, but since I’m such a planner it’s so front and center in my mind right now. I’ll keep you posted and wish me luck! 1. For the regular mint pesto, pulse almonds with garlic in a food processor until coarsely ground. Add cheese and the oil; process to a coarse paste. Add mint, and pulse a few times until coarsely chopped. Season with salt and pepper. 2. For the healthier mint pesto, using a blender or food processor, blend all ingredients until smooth. Add salt and pepper to taste. 3. 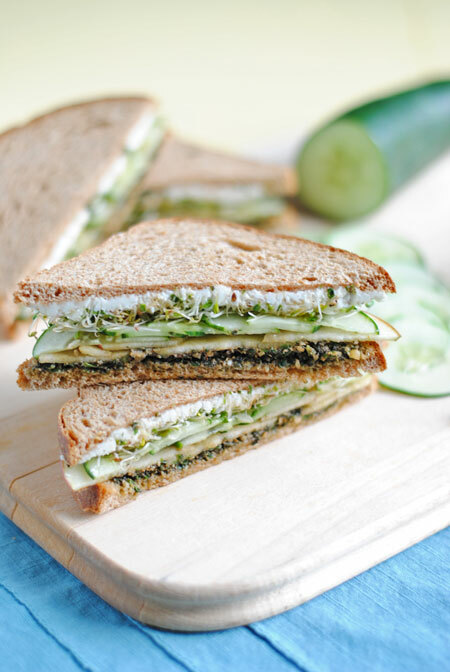 To assemble the sandwiches, spread 2 tablespoons of goat cheese on 4 slices of bread. Top the goat cheese with about 1/4 sprouts for each slice. Next, on top of the sprouts, layer the cucumber and apple slices. 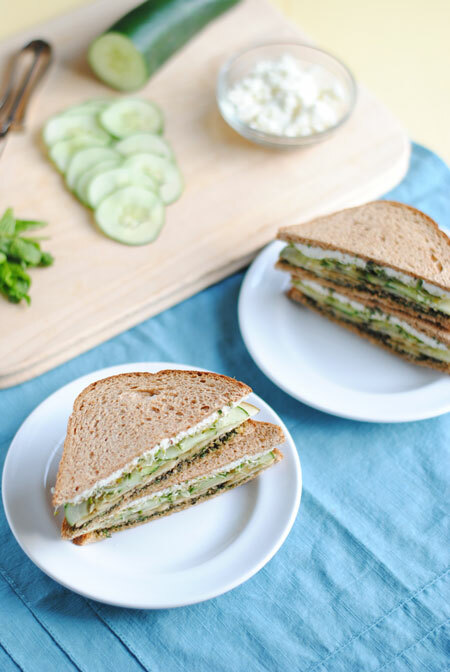 Spread the mint pesto on the remaining 4 slices of bread and top sandwiches. This is so fun! I love anything with cucumber, I could eat my weight in them! But the goat cheese+mint pesto, it sounds just heavenly! Hi Leah, sounds like you have some big changes coming up, wish you all the luck. Seems like you think everything out and are a great planner, so you should be fine, if not great!! 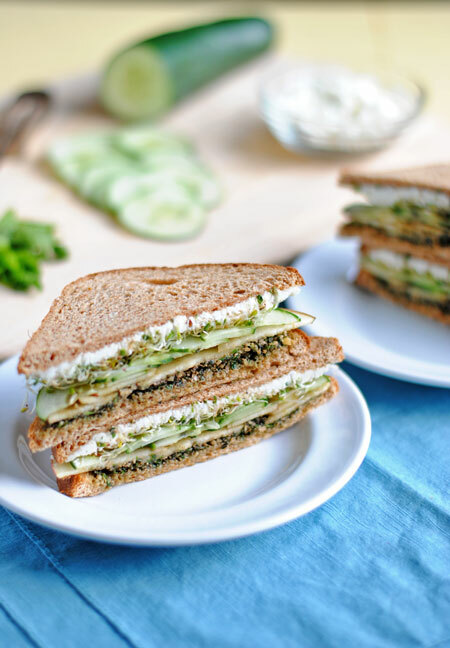 Love everything about this sandwich, mint pesto oh yeah! I love love LOVE the idea of mint pesto + goat cheese. This is a must-make-soon kinda’ recipe. Did you slice your apples + cukes by hand? If so, girl, you need to get an award! Perfectly thin! Jealous of those skills. Girl, you know I am the queen of moving….and not by choice either. I’ll send you my tips and thoughts. (wink-wink). Anyhoo, this sandwich looks awesome. I’ve never had mint pesto, but it sounds fab! Now you are talking! I LOVE goats cheese, but I also love that you have added some apple in to this. Apple and cheese go so well together. good luck with the apartment search! i’m a fan of east nashville :). you should move here and share all of your lovely food photography props with me!! in return i will buy you endless jeni’s ice cream. What a creative sandwich, Leah! I always love finding different types of sandwiches when I go out to eat. The combination of goat cheese and mint together sounds very intriguing! And good luck with your move! My husband and I are talking about maybe visiting Nashville in the fall, I’ve never been and it sounds amazing! Leah, I wish you all the luck with the move. I am sure everything will be all right! The idea of mint pesto is totally blowing my mind! I love everything mint and am sure I would go nuts over this. This sandwich looks like a real winner!!! Best of luck to you with selling your place and moving closer to Nashville. I didn’t know you were in the Nashville area! That’s one city I’ve always wanted to visit! If I’m ever in the area, I’m calling you up! This sandwich sounds so yummy! I love the idea of using mint pesto! You should! It’s a pretty fun town and we have TONS of awesome restaurants. I can hardly keep up! Leah, this looks sooooo good! I love the combination of flavors! This sandwich looks fantastic! Love the sound of the mint pesto with goat cheese! How awful that they stopped selling it on the menu! That must have been such a disappointment! It looks like you did a great job re-creating it though, and it was probably also much cheaper to make at home. I love anything and everything with goat cheese and this sounds amazing! YUM! This looks delicious!! What a great recipe! I love what you said about it being tasty… and flavorful, but not heavy!! YUMMY, healthy and satisfying! Win win win! 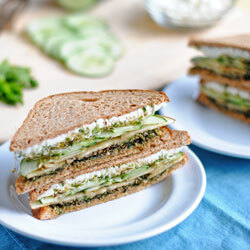 Never has a cold, vegetarian sandwich looked THIS delicious! Like, seriously. 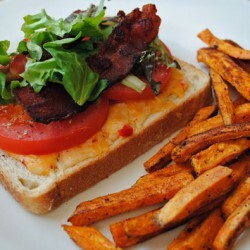 I’m always so jealous of meat-eater’s sandwiches because they look so thick and amazing, but this looks killer! Great job with the recipe and food styling — I’m in awe of these! Teach me your sandwiching ways. Ha ha! Thanks so much for the sweet compliment, Kelly! 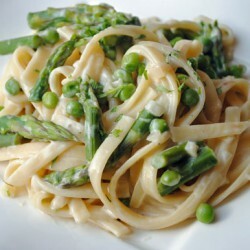 I just found you blog and am looking forward to trying your recipes. I love Pinewood Social and this looks delicious. I linked to it on my blog today. Good luck on the move!! Hi Catherine! Thanks so much for stopping by and for including me on your blog!